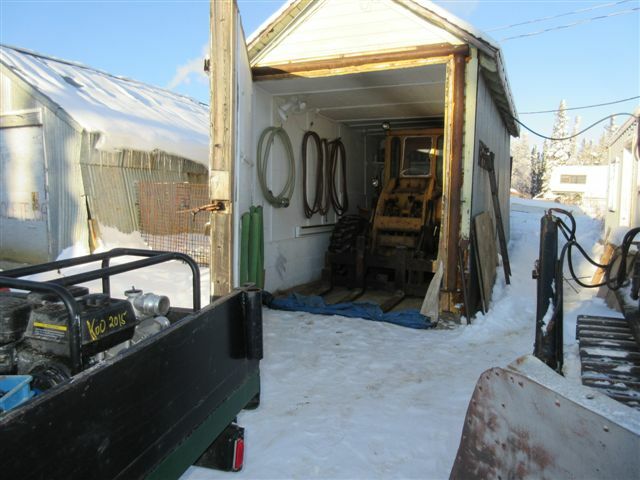 AFTER LETTING THE 1939 CHEVY AND THE FLOODING EQUIPMENT DRY OUT OVER NIGHT IN MY LITTLE SHOP, IT WAS TIME TO PUT EVERYTHING AWAY UNTIL NEXT TIME. 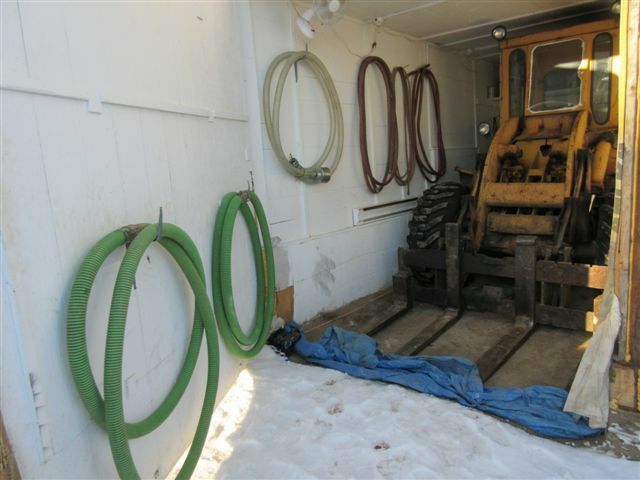 SINCE I HEAT THE LOADER SHED SO THE 46 YEAR OLD LOADER WILL START AND STEER, IT IS PERFECT PLACE TO STORE MY FLOODING EQUIPMENT. EVERYTHING HAS BEEN DRAINED AND ROLLED UP UNTILL NEXT TIME I NEED THE HOSES. 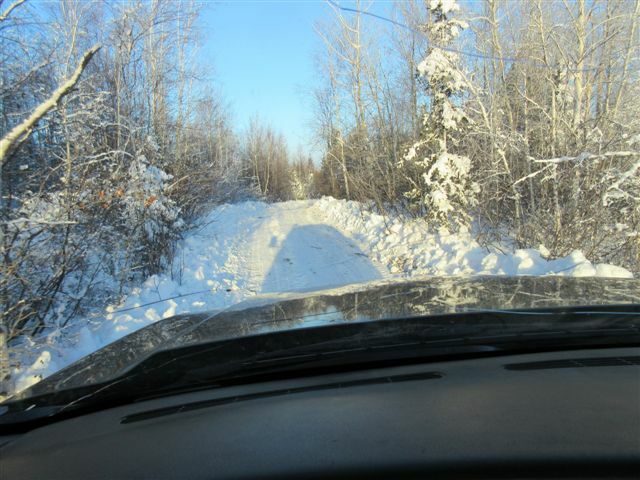 IT IS A QUICK DRIVE DOWN TO THE SWAMP IN THE 1939 CHEVY. 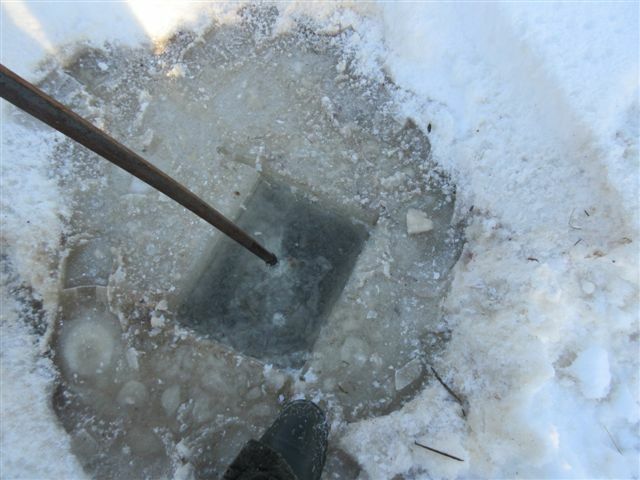 THE NICE COLD TEMPERATURE OF -23c OVERNIGHT MADE THE FLOODING A SUCCESS. 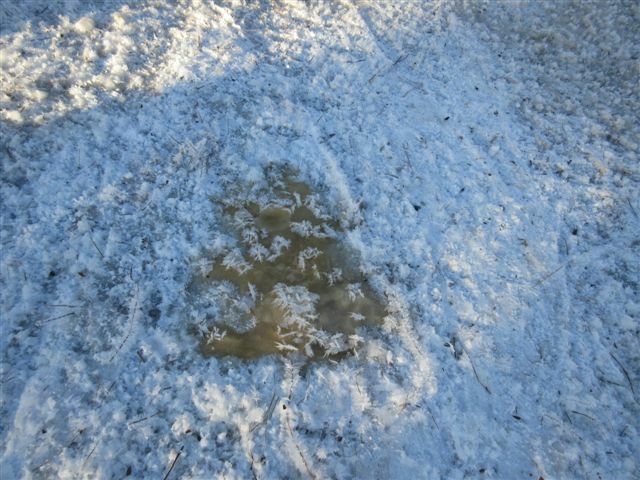 YESTERDAY DuRING THE FLOODING THE SNOW TURNED TO SLUSH WITH ALL THE WATER, NOW IT IS ROCK HARD. 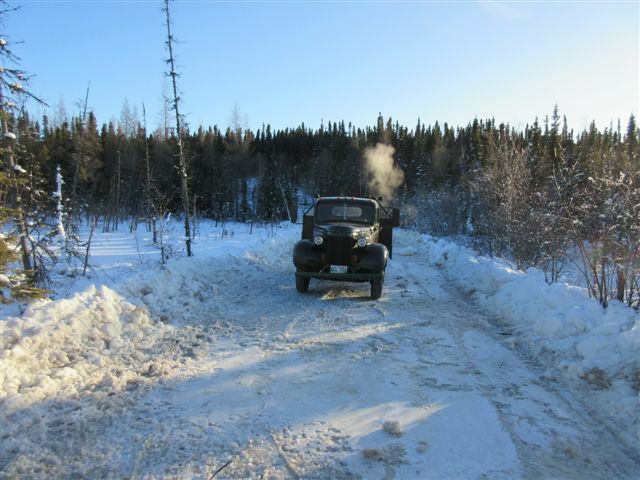 IT IS NICE AND COLD AND THE 39 CHEVY IS GIVING GREAT EXHAUST FOG. 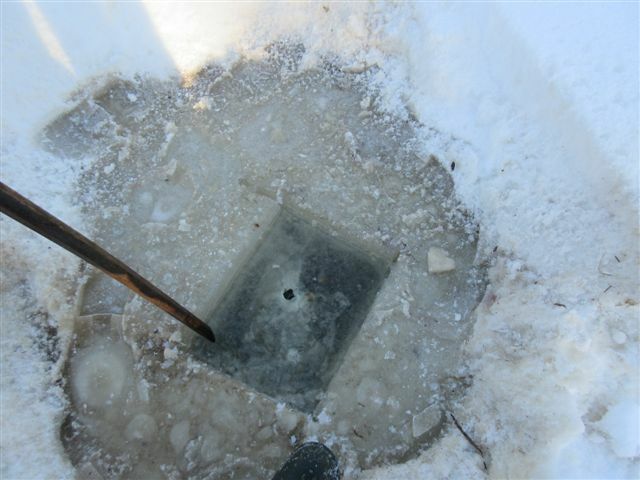 THE ICE HOLE DID NOT FREEZE OVER TOO WELL BECAUSE THE SWAMP WATER STILL HAS A LOT OF HEAT IN IT. 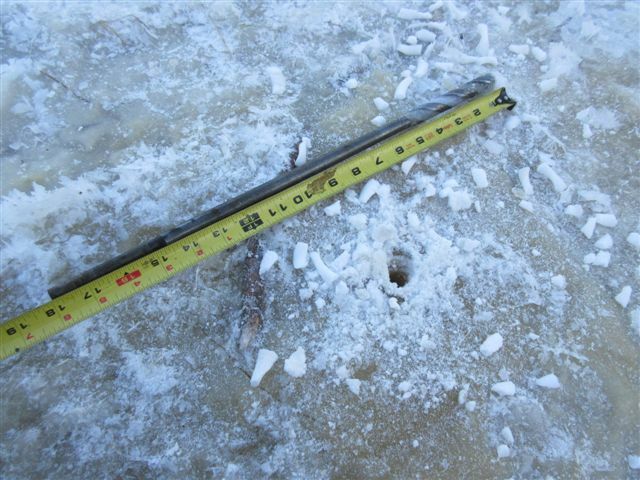 THERE IS LESS THEN 1" OF ICE FOR 24 HOURS OF FREEZING WHICH IS NOT GOOD. 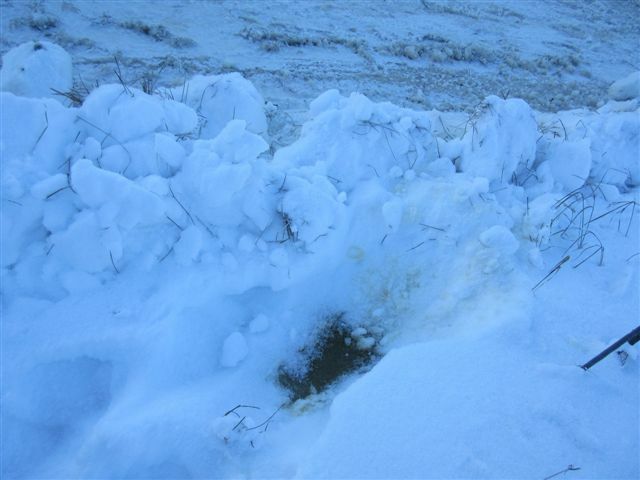 THE BEST PART ABOUT THE FLOODING BEING SUCCESSFUL WAS THESE ICE MOUND OF SWAMP WATER. WHEN I FLOODED THE SWAMP WITH ALL THE WATER, THE WEIGHT OF THE WATER PUSHES THE SWAMP DOWN AND UP COMES AS THESE. 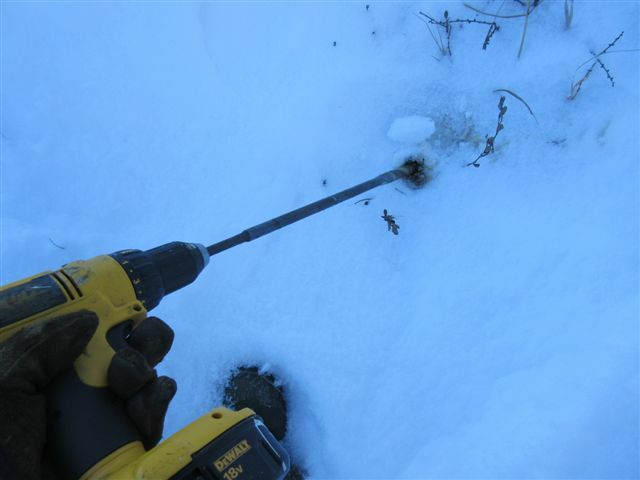 TO TEST THE FLOODING I USED A CORD-LESS DRILL AND A WOOD BIT TO DRILL DOWN TO SEE HOW THE FLOODING DID. 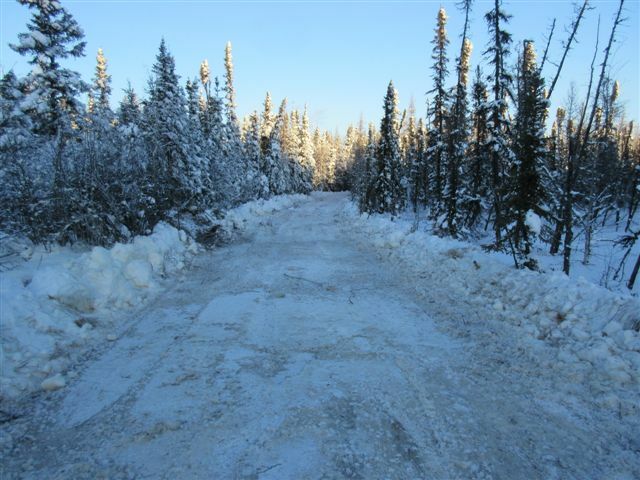 WITH 16" OF FROZEN SWAMP IS VERY GOOD FOR THIS ROAD TO BE USED. 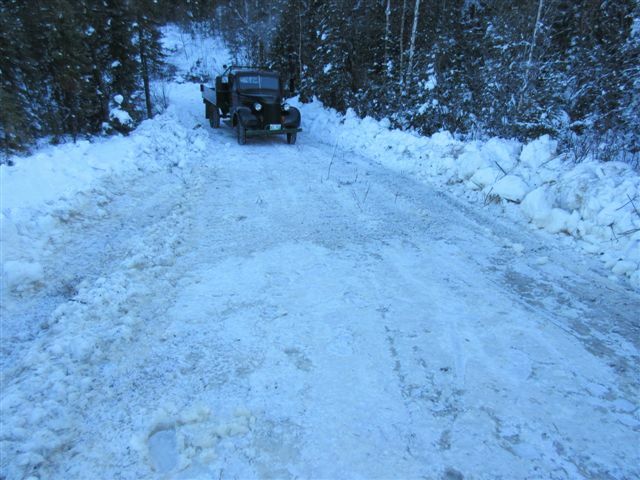 ONLY 10 FEET FROM MY WINTER ROAD WHERE THE SNOW HAS NOT BEEN DISTURBED, IT STILL NOT FROZEN VERY WELL. 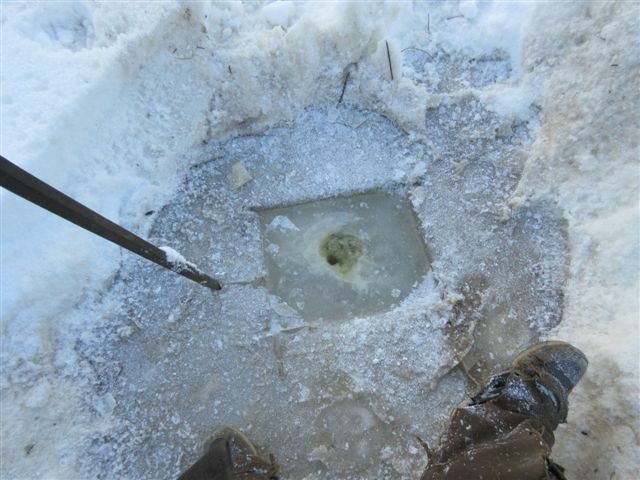 THE SNOW COVER HAS INSULATED THE SWAMP FROM FREEZING AND DUE TO THE WARMTH OF THE SWAMP THERE IS LESS THEN 6" OF NOT VERY GOOD ICE. 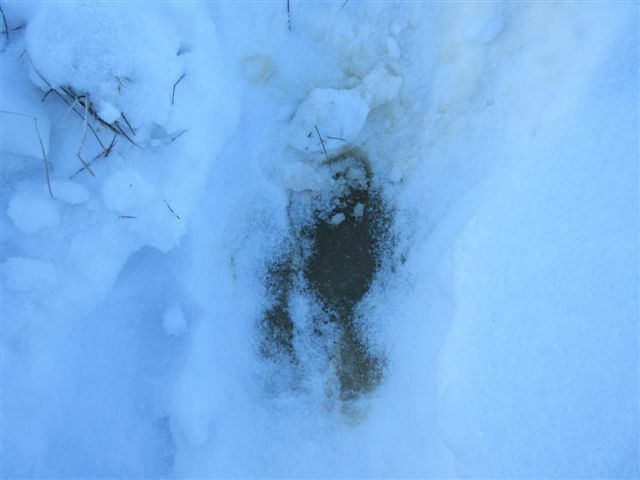 WHEN I PUMPED LOTS OF WATER ON THE SWAMP, SOME OF THE WATER FLOWED OUT AND UNDER THE SNOW. 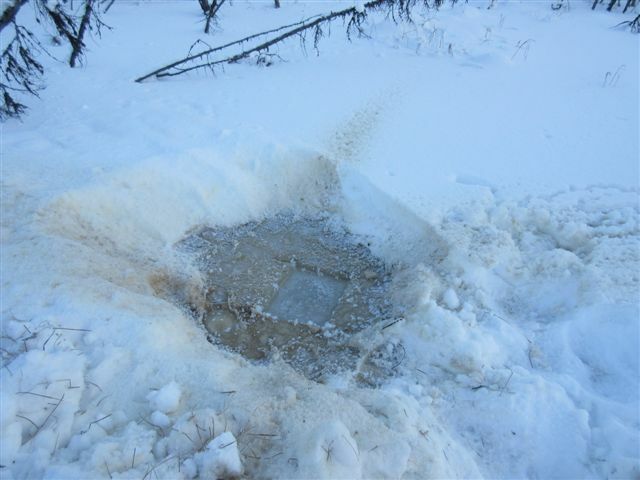 IT IS HARD TO BELIEVE THAT 24 HOURS LATER AND A TEMPERATURE OF -23c, THE WATER IS NOT FROZEN ON TOP OF THE ICE AND UNDER THE SNOW. 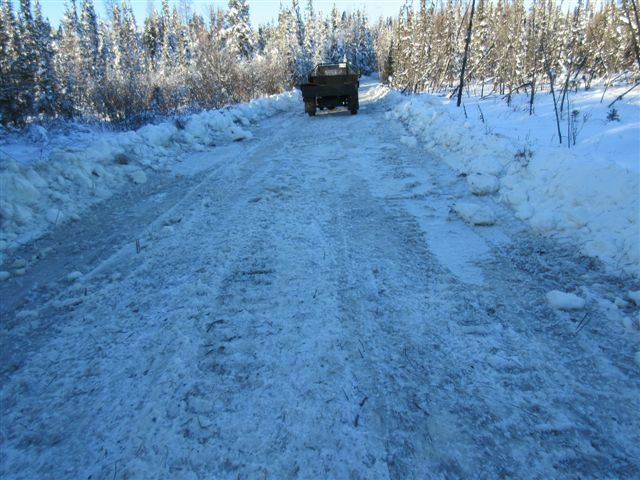 NOW ALL I NEED TO FINISH THIS WINTER ROAD IS MORE SNOW WHICH WILL BE DRAGGED TO FILL IN THE HOLES AND MAKE IT SMOOTH. AFTER ALL THE TESTING WAS DONE IT WAS TIME TO HEAD BACK TO THE "KINGDOM". 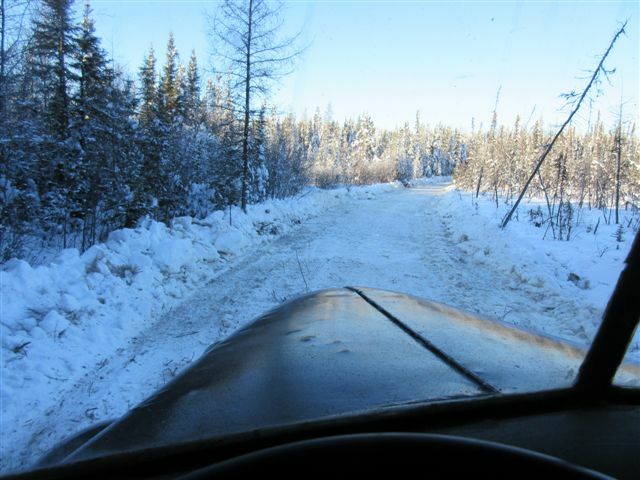 ONE DAY LATER ON JANUARY 07 2016 WITH AN OVER NIGHT TEMPERATURE OF -32c, I HAD TO CHECK MY WINTER ROAD. 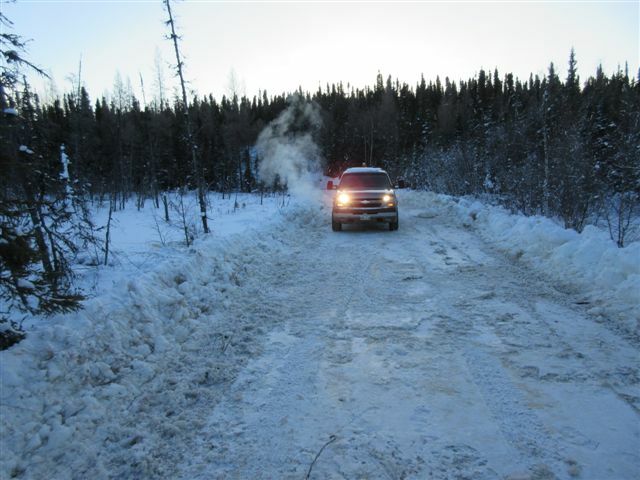 I WAS DRIVING MY 2006 CHEVY PINK CREW CAB WHICH I DON'T WANT TO SINK IN THE SWAMP BUT I THINK IT IS FROZEN NOW, LOL. 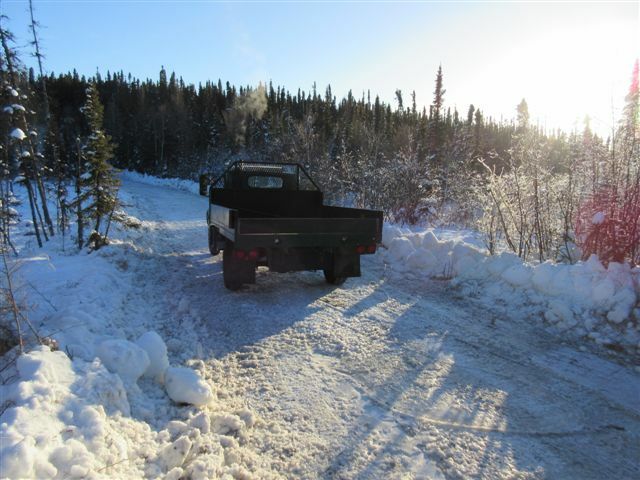 WHEN I ARRIVED AT THE SWAMP AT 10am IN THE MORNING, IT SURE LOOKED EXTRA FROZEN AT THESE TEMPERATURES. ONCE AGAIN THE EXHAUST FOG LOOKS GREAT. 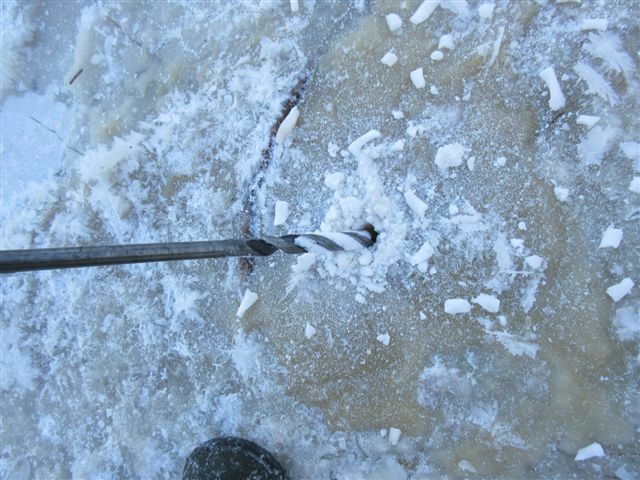 THE ICE HOLE FINALLY FROZE OVER WITH SOME GOOD ICE. 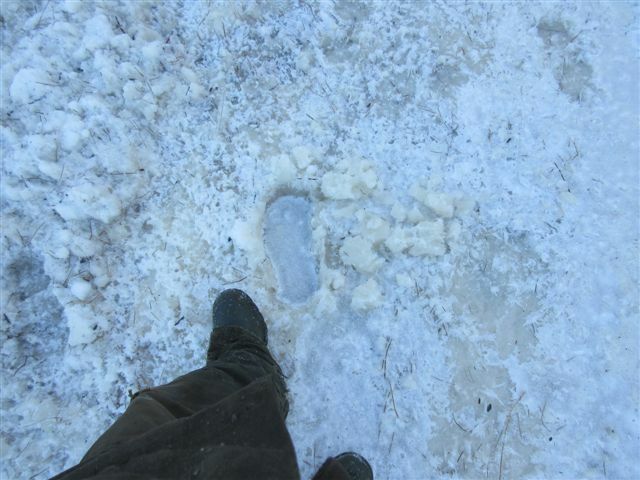 IT TOOK A BIT TO CHIP AWAY 3-4 INCH OF ICE WHICH IS REALLY GOOD FOR 24 HOURS OF FREEZING AT -32c. 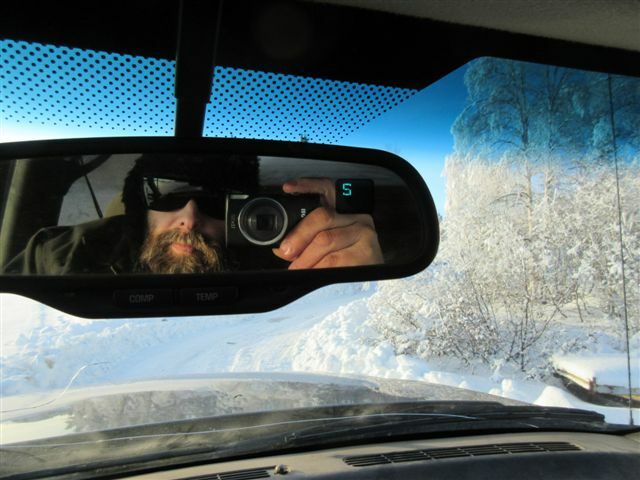 AS I DRIVE BACK TO THE "KINGDOM', I TRY TO TAKE A SELFIE WITH THE TEMPERATURE IN THE MIRROR BUT THAT DOES NOT WORK. 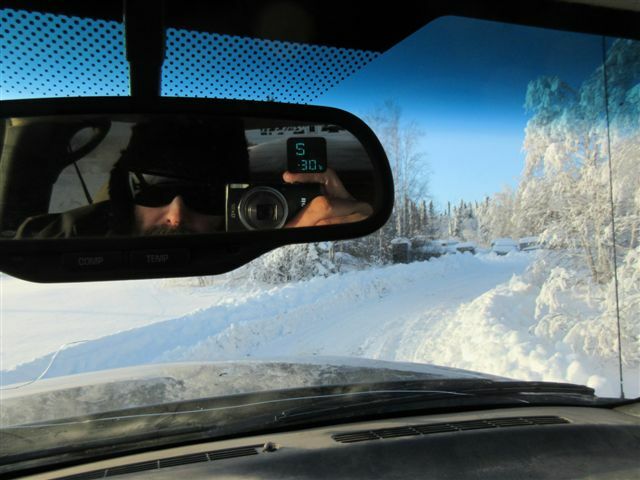 ABOUT THE 6TH TRY I GOT THE TEMPERATURE IN THE MIRROR AT -30c WHICH IS CLOSE ENOUGH. 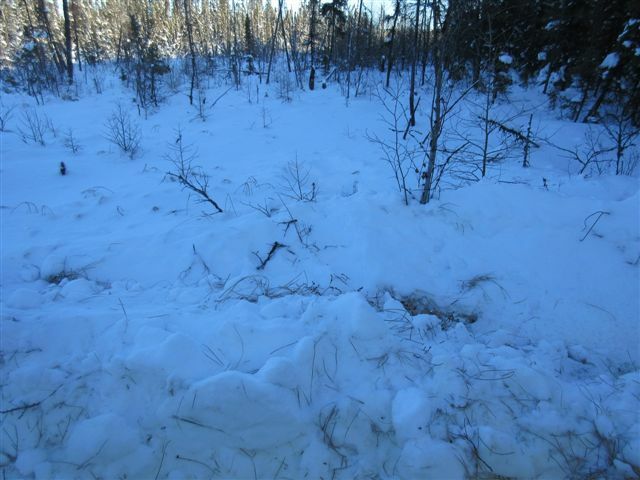 MORE TO COME WHEN WE GET SOME SNOW.